“Green Up” is a versatile production solution. 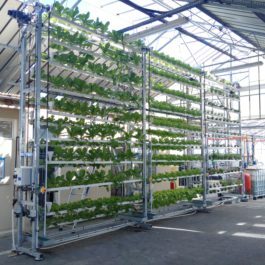 It has been designed and optimised for vertical farming in urban areas. It works within the constraints of farming in inhabited areas because it is silent (no disturbance for neighbours), lightweight (suitable for roofing), resource efficient (closed fertigation system) and reduces waste (growing with NFT). It can be installed on the roof of a building because its floor load is low. The continuous fertigation system helps to bring plants the nutrients they need continuously. The crop troughs rotate which guarantees that each plant gets the same amount of natural light. In addition, the use of supplementary LED grow lights enables crops to be grown throughout the year. Finally, the aim of the design (conceived by a group of complementary players) is controlled operating costs, an extended life cycle and an investment cost which is in line with market-based economic data. Company name: Etablissements CHABEAUTI S.A.S.